What Is The Ecological Significance Of A Whale Fall? A whale fall, a carcass of a cetacean, can create a complex localized ecosystem in the deep sea. Whale falls sustain complex ecosystems in deep waters. A whale fall is a phrase used to describe a cetacean's carcass that has settled in the abyssal or bathyal zone, that is, deeper than 3,300 feet in the ocean floor. 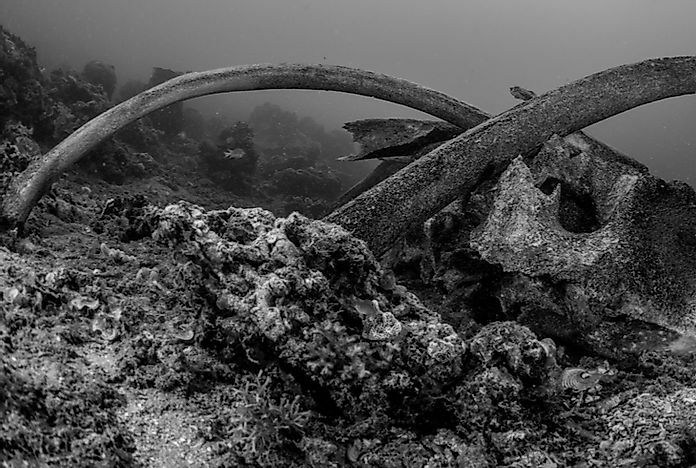 The carcass represents a localized and complex ecosystem which has supported deep-sea creatures for centuries. A whale carcass attracts scavengers in shallow waters but sustains life in deep waters. The presence of a whale fall in the deep ocean is made possible by the high hydrostatic pressures as well as the cold temperatures. Warm waters and a higher occurrence of predators provide for the faster decomposition of dead whales in the coastal ocean. Decompositional gases may cause the carcasses to float. How Were Whale Falls Discovered? In 1854, an undiscovered mussel species was recovered from a chunk of floating whale blubber. This incident was the initial indication of the potential of whale carcasses to host specialized animal populations. Deep-sea trawlers had by the 1960s extracted other undiscovered mollusk species attached to whale bones. The first abyssal whale fall was recorded on February 19, 1977 by three Navy pilots of the American bathyscaph Trieste II. The carcass was without any organic tissue, and it had sunk flat on the ocean floor while intact. Phalanges and a jawbone were recovered. The whale was regarded to be a gray whale because of the size of both the skeleton and bones, the absence of teeth, as well as the location site west of Santa Catalina. In 1987, a group of marine biologists under the leadership of the oceanographer Craig Smith unintentionally discovered another whale fall. The remains were identified by the DSV Alvin at 4,070 feet in the Catalina Basin by use of a scanning sonar. Naval submarines, deep-sea explorers, and researchers have since identified more whale falls. The use of sophisticated side-scan solar has facilitated the increase in detection since it can minutely scrutinize the sea floor for large chunks of matter. Scientists have reported at least three decomposition stages linked with a whale fall based on data extracted from Santa Catalina and some other case studies off the California coast. The first stage is termed as the mobile scavengers stage. The dead whale attracts a dense population of hagfishes, millions of amphipods, massive sleeper sharks, rattail fish, and a small community of lithodid crabs. These animals are credited with the consumption of the soft tissue, and they can eat between 40 to 60 kg every day. A five-ton carcass, for example, was shown to last for four months. The enrichment-opportunist stage comes next where the animal's skeleton attracts mollusks, polychaete worms, and crustaceans. These creatures colonize the bones as well as the surrounding sediments which are filled with decomposing tissue. This stage can stretch for two years. The sulfophilic stage follows which can last for ten to fifty years. Chemosynthetic bacteria use sulfate to disintegrate the lipids stored in the bones and ultimately produce sulfide. The bacterial mats sustain sea snails, mussels, limpets, and clams. The last digestion stage can last for as many as 100 years because whale bones have a lot of lipids. Oceanographers have reported at least 16 new species in whale falls. The Osedax frankpressi and the Osedax rubiplumus are among these species of worms. These worms rely on whale bones for sustenance. The worms are remarkable in that they lack mouths, eyes, stomachs, and legs and make use of their green roots to infiltrate the bones. The worms have feathery plumes which appear reddish and which stretch into the water and serve as gills. The plumes link to a muscular trunk which can be retracted into a transparent tube should the worms detect any disturbance. A large egg sac is located at the trunk's other end. The greenish roots branch from the sac and contain bacteria which break down the oil located in the whale bones. The scientists who initially extracted these worms were puzzled because they were all females. Most of the female bodies, when put under a microscope, revealed dozens of dwarf males residing in their bodies. The male bodies still had bits of yolk, but they also possessed bounteous amounts of sperm. The females were also full of eggs. The worms appeared to have adapted to their lifestyle such that a lot of eggs would be released to ensure that a tiny proportion of them was transported far enough by the ocean currents to chance upon another whale carcass. The Rubyspira osteovora and Rubysira goffrediae are sea snails deriving their nutrition from whale bones. The species belong to the Gastropoda class and the superfamily Abyssochrysoidea. The R. osteovora inhabits the sediments close to the whale bones, and it sports a broad and short radula. The R. goffrediea inhabits the bone and has a spiky and long radula. What is the Importance of a Whale Fall? A whale's carcass represents a significant stage in the carbon cycle. A forty-ton carcass will typically contain carbon in approximate amounts of two metric tons. This amount is almost the same as the carbon transported to a hectare of the abyssal zone in 100 to 200 years. The sinking carcass brings carbon got from the water surface mostly in the form of plankton. A large whale represents more carbon-filled tissue. The deep sea is not blessed with the same rich food resources like the water surface, and a whale fall enables populations of organisms to survive in a so-not-friendly habitat. Over 400 animal species have been shown to rely on a whale fall, and thus dead carcasses are integral parts of the ocean ecosystem. Examples of organisms identified in whale falls are sleeper sharks, giant isopods, lobsters, hagfish, prawns, sea cucumbers, squat lobsters, and bristleworms. A consistent group of creatures has been found to reside in whale fall habitats. The vesicomyid clams and mussels are categorized into groups that contain chemosynthetic bacteria and which can extract energy from inorganic chemicals. The lucinid clams inhabit anoxic seafloor sediments and seeps. Similar ecosystems have been discovered when other massive volumes of material with rich nutrients sink to the seafloor. Large trees can form wood falls, while sunken beds of kelps represent kelp falls. What Is The Significance Of A Choke Point? What Was the Significance of the Bamako Convention?